Healthy Cookies for Healthier Baking! Christmas can often be synonymous with sugar. Loads and loads of sugar. And, while I am not one to say that there isn’t a time and place for sweets and cookies and all things sugary and glittery, I do feel that we often turn to those simply because we don’t know the alternatives can be so good. This Christmas season, in the midst of the wine and cheese plates and sugar-laden cakes and cookies, I encourage you to try some healthier variations to share with your friends and families. Not only will they be a refreshing break from the sugar-highs and sugar-crashes you’re used to experiencing, I think you’ll find many healthier ideas incredibly delicious and inspirational in making you want to repeat them, not just because they’re “healthy” but because they taste so good! * Use oatmeal whenever possible. It adds filling fiber and takes the place of regular white flour (empty calories). * Substitute applesauce for butter. You can read up on the best ways to do this, but I’ve had great luck with it and actually prefer many of my recipes this way. * Try to include recipes with nuts. Protein and fiber boosts are great ways to curb extensive holiday eating. * Toast your spices. You’ll need less of the sugar and fat when your spices have a fuller flavor from the toasting process. * Use fruits to sweeten whenever possible. Bananas are practically dessert themselves, see where you can add them. Make your own fruit sweeteners. * Use Yogurt! I adore yogurt, and the more recipes I can find to use it, the happier I am. It’s loaded with protein, its fat-free, and it gives an extremely moist texture to things like muffins and breads. And now, here's a healthy cookie recipe that is perfect for adults. You'll love the flavors, and it goes well with your Christmas drinks or Hot chocolate, but the best part, you'll never know its Healthy! Just use your coffee makers with your favorite coffee flavor, and follow the recipe for a delicious treat. Preheat oven to 325°F. Line two baking sheets with parchment paper or a silpat. Process almonds, coffee, sugar, and salt in a high speed blender or food processor until fine. Transfer to a mixing bowl. If using almond flour, you can skip the blender/food processor and mix the ingredients right in your bowl. Fold nut mixture into the egg whites. Add the vanilla and cinnamon and mix just until blended. Spoon the batter onto your cookie sheets. Bake for 20-25 minutes until golden brown. 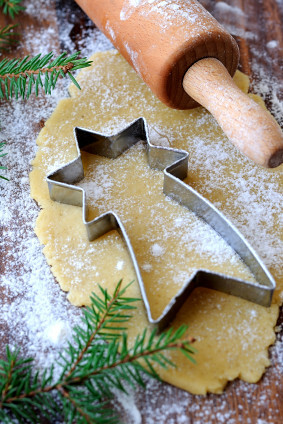 For more Christmas Baking, check out these Christmas Recipes at Fun and Food Cafe. Mansi loved this recipe--- bookmarked ! I like your blog and I post your blog link on my blog as my blog is about others blog (I just want give a common place from where people can reach to the best blogs available on some specific topic) your blog is the first blog in my food list. health is the main criteria that should be taken care of watched over anything else.When there is health you can enjoy life else it is hard and lonely. Nice blog. Have bookmarked this blog to see more delicious recipes like this. I love ur blog and the recepie but dont want to put on weight.. This a great healthy recipe. Happy New Year!Your pictures are beautiful. This cookie recipe sounds great! And thank you so much for the great tips!